"I have no idea what to do." 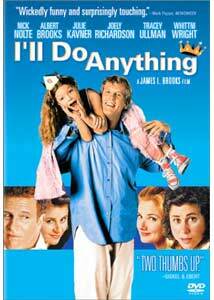 James L. Brooks' 1994 movie-about-making-a-movie comedy, I'll Do Anything, was originally shot as a musical, and when test audiences savagely tore it apart it was quickly re-assembled sans songs. It's hard to imagine a musical with Nick Nolte and Albert Brooks as being anything but oddly surreal, and I'll Do Anything has sort of become the stuff of whispered legend, as intriguing as Jerry Lewis' unseen clown-in-a-Nazi-prison-camp epic The Day The Clown Cried. I was looking forward to this release from Columbia TriStar, hoping that some fragments of the original musical production would have been included as supplements, but unfortunately that didn't happen. Matt Hobbs (Nolte) is a struggling, out-of-work actor who is given unwilling custody of his bratty six-year-old daughter Jeannie (Whittni Wright), whom he hasn't seen in two years, when his ex-wife (Ullman) is sent to prison. Hobbs also has begun a burgeoning romantic relationship with a young development executive (Joely Richardson), and this paves the way for a potential opportunity for him to restart his fading career by starring in a remake of Mr. Deeds Goes To Town. A subplot has Albert Brooks as a comically self-centered producer, wooing his loyal assistant (Julie Kavner), with Brooks doing his usual caustic, neurotic schtick and he delivers some of the film's best laugh-out-loud lines. The story moves rapidly back-and-forth between Hobbs' attempt at a comeback and his often sit-com-ish relationship with his manipulative daughter, and I get the feeling that in the musical version some of the glossed-over plot points were probably fleshed out a bit more. Still, Nolte is likeable as Hobbs, and he is probably the only truly decent person in the whole film. The rest of the cast are fairly vacuous Hollywood types, and even Wright's precocious Jeannie straddles the thin line between cute and obnoxious. Being a Brooks film, I'll Do Anything is all about sharp, inciteful and funny dialogue. There is a quite a bit of lampooning of the whole Hollywood "scene," and the knee-jerk shallowness that is so prevalent in that world. For example, a development executive reads off a list of potential lead actors (John Malkovich, Ed Harris, Tommy Lee Jones, Willem Dafoe) and offers brutal one-line dismissals of each, and the merit of a character's screen test is ultimately judged by a roundtable discussion of "Would you go to bed with him?" If you're a real movie geek, you will find there is quite a lot of bitter inside humor in this film, and while it's not completely essential to enjoying it, it is a substantially rewarding extra. The non-musical version, which in hindsight features some glaring continuity errors (likely a result of the re-shoots), is still a very entertaining and funny film, even without the big production numbers. That's not too surprising, considering that Brooks' is something of a golden boy who directs (As Good As It Gets, Terms of Endearment, Broadcast News), writes (Taxi, The Mary Tyler Moore Show) and produces (The Simpsons, Jerry Maguire, The Tracey Ullman Show). Brooks wrote and directed I'll Do Anything, and he fills the screen with a lot of familiar faces too, like Julie Kavner, Tracey Ullman, Harry Shearer, as well as cameos by Ian McKellan, Rosie O'Donnell and Anne Heche. Image Transfer Review: Columbia TriStar has provided two viewing choices on this dual-layered disc, in either 1.85:1 anamorphic widescreen or 1.33:1 full-frame. Though there is some noticeable minor ringing and haloing, the transfer is generally a good one. Colors are rendered well, with natural fleshtones and solid black levels. The source print also appeared to be free of any blemishes or defects. Audio Transfer Review: This disc is outfitted with a nice 2.0 English surround track that while lacking any pronounced directional imaging, does exhibit some occasional rear channel activity. This is a dialogue-heavy film, and voices are generally cleanly mixed (though some of young Whittni Wright's hushed lines required subtitles to understand). Extras Review: Considering this film originally was shot as a musical (and later hastily changed), it's a shame that there isn't even a mention of that anywhere on this release, especially when much of the subplot in I'll Do Anything is built around the responses of test audiences. I would have loved to have seen something (lyrics, storyboards, screen tests) from the musical version represented here, but I'm guessing that stuff will never see the light of day. Instead we get nothing more than trailers (I'll Do Anything, Big Daddy, As Good As It Gets), 28 chapters, and subtitles (English, French, Spanish, Japanese). Where's my singing Nick Nolte footage? Even if it seems we'll never see the original musical version of I'll Do Anything, this release from Columbia TriStar is certainly a suitable replacement. It's still a very funny film that features a great ensemble cast and a script that provides a lot of caustic inside-Hollywood jokes for movie buffs who really pay attention.